Nicaragua is a country widely recognized for activism. During the 1980's, people came to Nicaragua individually and in groups to help with "the cause" which was, depending on the person, eradicating poverty and illiteracy, confronting the imperialism in its hostile acts against small and poor countries, or promoting socialism or some kind of bottom-up social and political organization. There were even food-based initiatives, promoting soy products and helping farmers produce with fewer chemicals and other costly inputs. Lots of things have happened in a few decades, but Nicaragua is still poor, and other nations are still wealthy and privileged. It is like a dream that the Sandinistas are again prominent in Nicaraguan politics, as they were in the 1980's. Things are very different between the two periods, some of them being the focus of foreigners today. Whereas back then solidarity and similar issues were the focus of most visitors from developed countries, lots of people come to Nicaragua today to enjoy sun and surf, which simply didn't happen decades ago. The millenial culture in wealthy countries, however, is not entirely hedonistic. No one is willing to risk a bullet to go to war zones, as a few, notable activists did back then. Nonetheless, there is a kindness and concern for the earth that is each day greater among people from the developed countries of the world. And, climate change is real, so the environment is among the themes most attractive to young people today. Young people heading to reforestation sites to provide assistance in forest restoration plots. Photo John Jackson. Another very big change over the thirty-year interval is in the connectivity worldwide that exists today. Back then, a telephone call to the US might take hours to connect, if at all, thanks to the embargo of the US government which blocked adequate development of communications systems. Today, most Nicaraguans are looking at their facebook accounts daily, sending messages to their mothers in distant countries, and reading the latest from all their friends both near and far. Long-distance communication is no longer the domain of the wealthy. With it, people know more about each other than ever before. Eco-Warrior Environmental Volunteers in Laguna de Apoyo can be drafted to take on even some simple tasks such as painting labels. Photo Pablo Somarriba. The closeness of people has also created a mutual affinity for some causes that transcend national boundaries. The environment, nature, and climate change are all issues that inspire people everywhere, today. 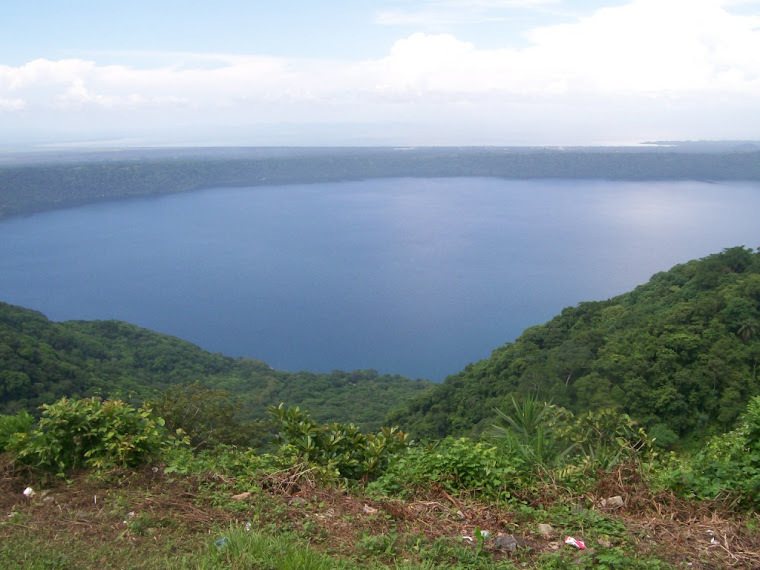 GAIA is providing opportunities for both Nicaraguans and visitors to the country to give back to the environment, through forest restoration, wildlife rescue, monitoring of forest and wildlife conditions, and other activities that benefit the wild nature in Laguna de Apoyo Nature Reserve. Trash collected along the beach of Laguna de Apoyo, much of which is to be recycled by the staff of Gaia. Thanks to so many who volunteered their energy to keep Laguna de Apoyo free of plastic! Photo John Jackson. One person's trash is another's treasure. These plastic bottles are recycled or reused as reforestation planters. Photo John Jackson. GAIA works with groups of people from inside and outside Nicaragua, to support the environment. The idea that Nicaraguans can care and provide a benefit to the environment is a relatively new one, in which the influence of people visiting have helped to form opinions and demonstrate that even small groups of people can make a difference. Lots of our visitors at Estación Biológica Laguna de Apoyo help with the care of wild animals. We at GAIA tend to have some or another wild animal around which needs a lot of care. We cooperate with the Ministry of Natural Resources and the Environment to care for any wild animals that need some kind of special treatment, usually because of an inappropriate reaction with a human. Some people stay for longer volunteer assignments and get more involved in the care and policies, even constructing and repairing enclosures. This baby bird is a Montezuma Oropendola. Its nest was destroyed by a North American landowner who didn't like the idea of having a colony of nesting birds in his yard, and had the branch which held this baby's nest cut down. The local park guard from the Ministry of Natural Resources and the Environment brought the bird to us to raise until the bird can fly and return to the wild. Photo John Jackson. We at GAIA would love to involve more Nicaraguans as volunteers in conservation activities. That's where you come in. We need your help to conduct these activities, either as a volunteer or a supporter with food, animal cages and transporters, or other resources. You can also provide assistance to our monitoring programs, where we follow bird, monkey and fish populations. Please consider joining us or making a donation! The forest restoration program managed by Gaia in Laguna de Apoyo Nature Reserve means a lot more than what most people think when they consider "reforestation". Planting trees is just part of making a forest. These young people are heading to tend to trees planted in prior years, to assure maximum survival. Photo John Jackson. Click on the serpiente emplumada to contact us.